During the recent years, Al Sheikh Al Qaradawy has defiled all his life achievements as if he wanted to erase his great history of favors and ideals . Al Qaradawy was a real example for moderation, his writings were of a great value . his moderation thought was not such superficial one of the public relations complain of the religion parties candidates . but his moderation thought is based on great rooted knowledge. But suddenly he turned to be the enemy of himself and his own nation and became a load on religion and life in general. I read, carefully and with respect, some of his books like : Halal And Haram In Islam (which means : what is allowed and what is forbidden according to Islam) , Islamic Awakening Between Rejection and Extremism, and recently I re-read his wonderful book Our Slandered History. I thought deeply about what he wrote in the former book considering the current issues, and I realized that he himself became one of those liars on both present and past. He was consistent and fought against extremism, wrote replays on Abu Al Alaa Al Mawdoudy and Saied Koutp's writings without hesitation or fear, and also criticized honestly and explicitly the ancient lies propagated by the extremists who tried to dominate the Muslim community who didn't surrender to their extremist thought. For example : Al Mawdoudy thinks that the whole Islamic history is useless as, in his opinion , and the pre-Islamic era begins with the reign of the 3rd caliph Othman BN Afan. Al Qaradawy devoted many pages , starting from page 47 and onwards, to reply on Al Mawdoudy, quoting some of his words : " Al Mawdoudy mistreated the Companions of the messenger (best prayers be upon him), like the third Caliph Othman Bn Afan" , he proved his opinions in his book The Islamic Government . Lets consider how Al Mawdoudy talked about the Islamic history as a part of the early pre-Islamic era starting from the days of the companions , and followers, and consider how unjust his words were. He described the whole Islamic civilization as "ignorant" one , he denied the Islamic civilization in Cordoba, Baghdad, Damascus, Cairo, and Delhi, and cut off any connection that may relate them to Islam . Al Qaradawy went on criticizing Saied kotb saying that :" Kotb was so vulgar when he spoke about Othman Bn Afan … al Mawdoudy was wrong when he said that Islam was applied only in the caliphs era only and all what came after was fake. 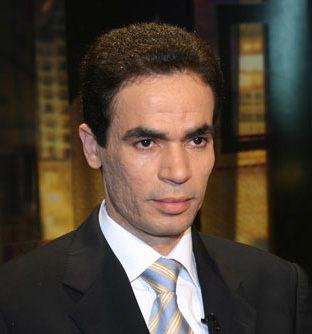 al Qaradawy, who said that years ago , has changed his mind after the evolution of June 2013. He attacked both Egyptian people and army as if Mohamed Mursi were a caliph. And when some people called for the necessity of discussion for a conciliation he said :"why .? and for whom ,the most important now is to get Mursi back to his chair." Al Qaradawy acted as if he lamented the fall of Islam but actually he was lamenting on the fall of the Muslim brotherhood government. Al Qaradawy contradicts him self, his acts and statements recently contradict completely all what he stated before. About morals and politics; al Qaradawy says in the same book Our Slandered History starting from page 152 onward, that Muslims have a strong bond between morals and politics, they can't reach a Nobel aim by dirty means. The means for Muslims must be as Nobel and clear as the goal aimed to achieve. So, no one can claim that he kills for god it is similar to who accepts to take usury to build a masjed. But these morals have vanished in favor of the pragmatic persona of al Qaradawy. During the last presidency elections, al Qaradawy stated that accepting bribes or swearing by god in case of lying all are accepting to make living , which shocked all people who loved him and supported him before. This pragmatic person called the United States to attack Syria in al Doha at masjed Omar Bn al khatab , and addressed Israel saying that :" don't panic, you think that when we finish from Syria we would turn back to resume attacking you, no, we wouldn't" . Then he went on abusing the Egyptian army and calling for it's defeat . He asked the Egyptian soldiers to disobey there leaders and asked the Egyptian people to struggle against the army, he even called the national society to stand against the Egyptian army . he asked people to go out in streets and squares on 6 October, the day of the Egyptian army's victory over Israel, to remove the authority of the army . all that happened after he had stated that the Israeli army considers morals more than the Egyptian one he said that : " the Israeli army has more humanities than the Egyptian one, they didn't harm the Palestinians as the Egyptian army did with the Egyptians ". On the other hand in the same mentioned book , al Qaradawy said : "the prophet Muhammad (best prayers be upon him) forbade damage in war , even if the enemy did that first , because Muslims are controlled by their religion and their great morals unlike others. But al Qaradawy nowadays refused to accuse the criminals who mangled with the Muslims dead bodies in the massacre committed by terrorists in Egypt . as if he was concerned only about not to mangle the enemies dead bodies , but he has no problem concerning the innocent people dead bodies. Al Qaradawy in his old days once said : " The Caliph Othman Bn Afan refused the bloodshed even if it were for his own favor or for defending him, and he preferred patience, he refused killing even if it was for defending his own life, he feared to meet Allah if he was a cause to kill some body. He also quoted what Moabad Al Khozaey said to Ali Bn Abe Taleb when he asked him how couldn't he revenge for the murder of Othman. But Ali replied : " Othman was our Imam – which means he was our great leader and ideal – and he forbade killing and once said : who pull out his sword in an intention to kill is not one of us" – he means not a real Muslim. But now Al Qaradawy frankly calls for killing, threatens to kill millions in favor of the authority. He called for the execution of the president during the Arab Spring, and later called for the execution of any one who disobeys the president during the Muslim Brotherhood reign. He called for bloodshed as a reply on removing Mursi. Islam was spread thanks to its principles and morals not wars or battles. Al Qaradawy now turned to be a cover for killing people, officers, and soldiers. He became the cover of terrorism in Sinai and the whole country in general. He forgot all what he said before about the principles of Islam, he became the religion cover for who call for killing and terrorism . There is another prominent example ; he once admitted that the Shiite and Alawites are not believers. Now the internet is full of his photos smiling with Bashar Al Assad, although Bashar has not changed his doctrine yet, and their meeting was based on his (Bashar) beliefs. If Al Qaradawy didn't change his attitude towards Al Shiite , or even didn't change his political opinions about Bashar; he wouldn't appear such contradicted. But he changed his mind about the religion issues according to his political attitudes which was a shock. There are so many contradictions and mistakes made by him, but this essay is not meant to assault him at all; we are trying here to call him to come back to his mind. And call him to humiliate again after all his speeches filled with "Ego" – proud of himself- his last congregation on masjed Al Azhar was a mere review of his biography, which is some thing not appropriate for him or the congregation as well . He became so proud since it was said that he was the first to call to the revolution while in fact he wasn't . he appeared as a peacock not as an Islamist thinker . then he was deceived by the power of politics and media that made him unable to distinguish what was wrong and what is right . Once he was on the front , now he is on his way to the bad end . and because I was one of his lovers ; I want to call him back to humble himself , apologize and repent .. I ask God the good ending for all of us and him .